I am such a geek! I realized I had 4 cameras with me on Friday. One Polaroid, one toy camera, my digital and my phone has a camera. I didn't actually use that one though. 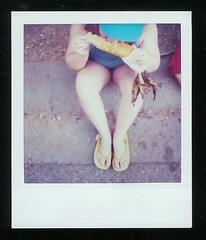 This Polaroid of Robyn eating roasted corn is my favorite. if you click on it you can see more of the Polaroids. I haven't done anything to the digis yet, later this week. roasted corn, giant pretzel with cheese, mac and cheese on a stck, Pronto pup (like a corn dog but has a wheat batter and tastes better IMHO), red slushies, deep fried cheese curds, limeade, ice cream, all you drink milk for $1 (used to be a nickel) pork chop on a stick, Australian battered Potatoes and I think Rob had a taco at some point. met the Princesses, watched a parade with Clydesdale horses, saw people on stilts, witnessed a calf being born, saw a rollerblade stunt show, crammed into a photobooth, rode the Ferris wheel and the giant slide, walked and walked, rode a city bus, held hands and laughed, took pictures. It was a geat way to end the summer. Hope everyone is having fun this weekend!